Do Contractors Furloughed During the Shutdown Deserve Back Pay, Too? When Congress reopened government in October, after a shutdown that lasted more than two weeks, it elected to pay furloughed federal employees retroactively for the time they missed. Now, a group of Democratic lawmakers is calling on the government to similarly make whole federal contract employees. Del. 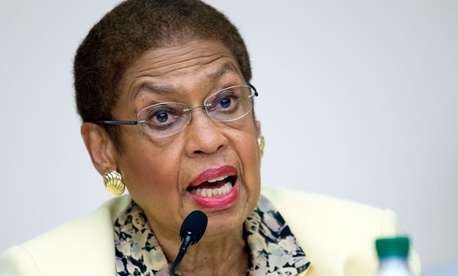 Eleanor Holmes Norton, D-D.C., introduced the Low-Wage Federal Contractor Back Pay Act, which would amend the continuing resolution funding agencies through mid-January to add appropriations for the retroactive pay. Some contractors providing support to federal agencies and buildings required their employees to take unpaid leave due to a lack of funding and agency closures. The bill would award back pay to federal contractors who provide “retail, food, custodial and security services to the federal government” and were forced to take furlough days during the shutdown. Norton said the idea for the bill, which has 11 original co-sponsors, came from the contract employees themselves, such as those who work on the U.S. Capitol grounds. Norton noted that despite the fact that the workers are employed in the private sector, the government should take responsibility for their back pay as the impact of the shutdown did not delineate between public and private-sector workers. “I recognize, of course, that contract workers are employees of contractors, but the distinction between federal workers and at least the lowest-paid service workers who serve the federal government and its employees and keep, for example, their premises clean, fails when it comes to a deliberate government shutdown,” Norton said. Not all contractors were affected by the shutdown; those working in support of the military received their pay on time, thanks to an 11th hour deal passed on the eve of the appropriations lapse.